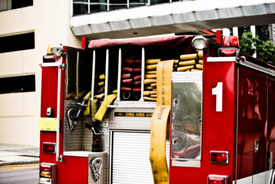 Legal news for Massachusetts firefighter attorneys – An investigation into a fatal fire truck crash has concluded that firefighters should be required to wear seatbelts. Firefighters should have proper training to operate truck air brakes, wear seatbelts. Boston, MA (www.NewYorkInjuryNews.com) – A recently released investigation report states that Massachusetts should enact legislation that requires firefighters to wear seatbelts and be tested on air brakes before they are permitted to drive trucks, as reported by the Boston Globe. The report looked into a 2009 fatal fire truck crash in Boston. The investigation was conducted by the Firefighter Fatality Investigation and Prevention Program of the National Institute for Occupational Safety and Health, (NIOSH) http://www.cdc.gov/niosh. It concluded that the lieutenant and the two firefighters who were involved in a fire engine crash in January 9, 2009 were not wearing seat belts. The crash killed the lieutenant. Also, the driver was not properly trained to use air brakes. Boston FD regulations did not require fastened seatbelts at the time of the fatal truck-building collision. NIOSH cited four key factors as culprits for the fatal 2009 crash: brake failure, poor maintenance, inadequate training and failure to wear seatbelts. Kevin M. Kelly was the fire lieutenant who lost his life when Ladder 26 slammed into an apartment building in Mission Hill. Three other firefighters in the truck sustained treatable injuries. Legal News Reporter: Tara Monks – Legal news for Massachusetts firefighter lawyers.